You may have seen a squirrel sitting on the ground eating a nut. What did it look like? The squirrel is a rodent. His colour is grey with brown strips on its body. It looks like a baby rabbit as it is very small in size with fur on ts body. He generally lives in trees and is very quick. Squirrel likes to eat nuts. 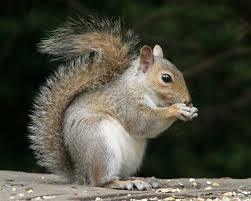 It has very bushy tail.It is an cute and naughty animal. 1. Why does the poet say the squirrel “wore a question mark for tail”? Draw a squirrel, or find a picture of a squirrel sitting on the ground. How would you describe its tail ? The poet said the squirrel “wore a question mark for tail” because the shape of the tail of squirrel sitting on the ground looks very similar to question mark. I would describe it as fur of clothes clutched together or bushy shaped. No, we do not usually say that an animal ‘wears’ a tail. We usually say that animal 'has' a tail. 3. “He liked to tease and play”. Who is teasing whom? How ?